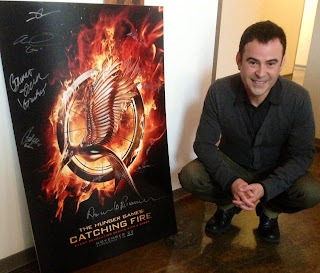 Nelson Ascencio who plays the role of Flavius (Cinna's head stylist) in the Hunger Games series, tweeted that he had recorded an interview for the special features on the Catching Fire DVD/Blu-ray. 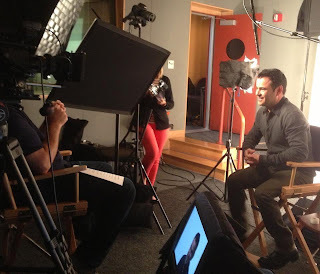 "Today I was interviewed for the DVD/BluRay Special Features for "Catching Fire". Call me dorky but I was very excited about it. Thanks to all the cool fans of the films who said "hello". Can't wait to see it myself." If you look closely at the bottom of the picture, you can see a screen which is showing the camera's view of the interview! It's great to see that they are working on the special features at such an early stage. They might be even better than The Hunger Games'! He also tweeted this picture, which appears to show other actors' signatures on a Catching Fire poster. Could they be asking all of the actors interviewed to sign it? It looks like there's quite a few on there including Amanda Plummer (Wiress) and Bruno Gunn (Brutus). We can't wait to see their interviews!